I doubt 4K is the next big thing for NOW. Sure we will be getting there but current top video cards can finally drive quite properly FULL HD with all eye candy turned on. Going 4K now is not impressive with current video card because raw power is not there. Sure you can display nice pics in 4K but gaming is another story. Like you said, 4K can get expensive. I work in visual effects for Film and TV and can generalise by saying we’re dreading 4K! 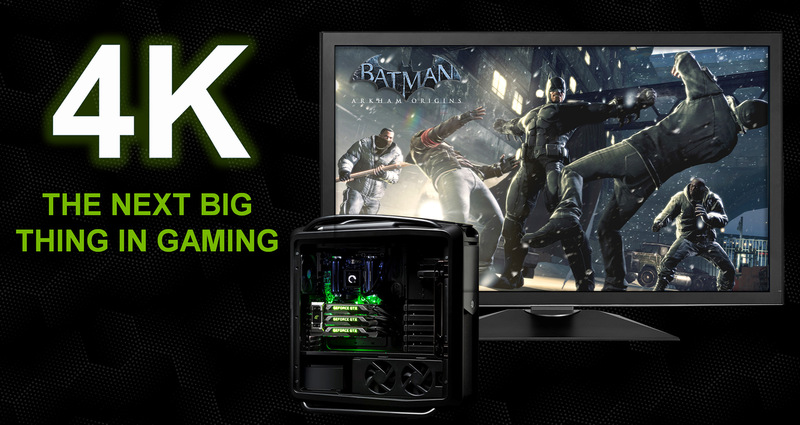 4K in gaming is quite silly for the foreseeable future; why ? because of content. Games are looking more and more amazing @ 2k/HD but are quite a FAR way off needing four times the resolution to resolve detail. when we went from 480p to 720p/1080p it was well needed for two reasons – 1080p was an acceptable resolution for the eye to resolve detail, but not see pixels, at most screen-sized relative to seating distance i.e a 24inch monitor on a desk or a 60inch display from the couch. Our hardware could render what the content creators could make in a nice balance. Just have a look at Tombraider for a really good balance of the two; but look closer and you’ll see it’s still a game with quite a few graphic limitations. It would take A LOT more effort to fill out a 4k screen and make it look *richer* than an HD screen; again, both from the hardware and creators side. What I think the hardware/performance side of 4k would actually be good for is making 3D (2xHD frames) or VR perform as well as a 2D 2K platform. e.g If we can do a 4K frame @ 60hz then I’ll use it to make a 2K 3D image @ 120hz. So lets use the bandwidth for better 3D or VR than being crazy and making more 2D pixels than the creator can enrichen. p.s I used to have the argument with a friend when the current-gen consoles were still in rumour : Question – PS3 could do 1080p games, Xbox could only do 720p so which one is worse ? Answer – at the same fill-rate the Xbox would make a nicer image at 720p than the PS3 at 1080p. It seems to me that more and more new games are coming out with 3D support either native or well sorted by 3D Vision et al. I know whenever an Unreal-engine based title comes out then I’m going to have a great time. Tombraider was incredible in 3D – a lot of the camera angles were set up for maximum 3D effect. I will never understand why more people do not embrace 3D gaming. I mean first of all, is YEARS ahead of movies…you are really INTO the game and can see all the work devs did to create such detailed virtual worlds. In 2D you just dont get that same feeling. I mean, where is the logic that after years in technlogy advances, and gaming getting so realistic, and spending tons of money to play your 3D games …you still prefer to play them on a freakin 2D flatlands experience?! I have no idea what is the thinking process that leads you that way..for me is akin to having 32 bit color gaming and playing on a monochrome screen. I’m guessing AMD and Nvidia are abandoning 3D gaming with standard monitors because the immersion 3D gaming provides will be bested by VR experiences such as the Oculus Rift. I realize that even the consumer Rift will not have the same potential resolution that a surround 3D vision setup has, but 4k gaming and the eventual production of small 4k displays will bridge that gap and will provide a better immersive experience. There’s an argument that games not ‘designed’ for first person or the Rift in general will work better with 3D vision, but when 4k comes around and we see it ported to VR, i’m guessing the enthusiast will get a better experience playing that 3D ‘monitor-designed’ game on a Virtual IMAX screen on a 4k setup. Before embarking on the voyage of never ending display resolution upgrades, bear in mind the limitation of the eyes themselves http://reviews.cnet.com/8301-33199_7-57566079-221/why-ultra-hd-4k-tvs-are-still-stupid/ , The benefits from upgrading from 1080 to 4k when you add motion to the mix, would be mostly undetectable. However using 4k for S3D gives a much larger perceivable benefit and would make it worthwhile. So I’m waiting for the glasses free 3D 4k TVs to start hitting the consumer market in 2014-2015. Why watch/play in 2D when the world was finally proved not to flat in the 1600s.